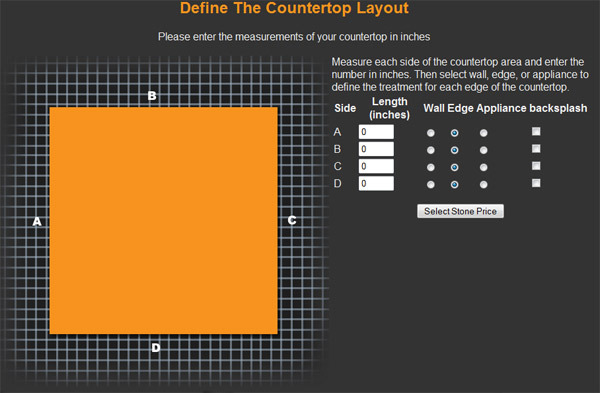 the next step is the customer adds the length in inches per the layout grid letters and sets the edge style whether its a wall edge treatment or appliance and whether or not they want a back splash. 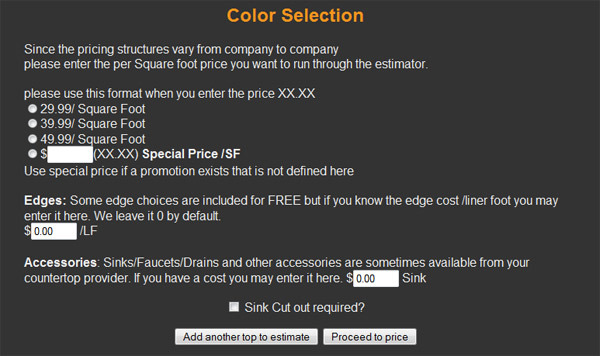 Next the customer sets the price based on current offers available as well as options they would like such as free or upgraded edges or undermount sink and faucet accessories. this is also where we collect som details concerning sink cutouts and taxes depending on state. Next we collect customer information to associate the estimate and the user must agree to the terms and conditions of the estimator. and finally we present the estimate to the customer. This estimate is also routed immediately to the local representative where they also may review the estimate and the customer is able to have a productive conversation about the estimate they have just received.